Penguin Publishing Group, 1994. Mass Market Paperback. Very Good. Disclaimer:A copy that has been read, but remains in excellent condition. Pages are intact and are not marred by notes or highlighting, but may contain a neat previous owner name. The spine remains undamaged. At ThriftBooks, our motto is: Read More, Spend Less.Dust jacket quality is not guaranteed. Berkley. Fair. 1994. Paperback. 0425140431 . Ex-Library; 7 oz. ; 279 pages; Ex library PB reading wear/aged tape reinforced edges solid reading copy only. A mother murdered. A child alone. A novel of terror too close to home. .
Mass Market. Berkley Books 1994. Water Stain on Edge. Good Condition. Unless Listed in this decription, VG or Better. Berkley Publishing Group, 1994/11/01 00:00:00.000. Mass Market Paperback . Good. Nickolae,Barbara Kiss Mommy Goodnight All Orders Shipped With Tracking And Delivery Confirmation Numbers. Berkley Publishing Group, 1994/11/01 00:00:00.000. Mass Market Paperback . Good. Nickolae,Barbara Kiss Mommy Goodnight Light edge & corner wear from shelf. Paper punch in cover. Almost like new. Pages clean & tight. All U.S. orders shipped with tracking number & e-mail confirmation. All Orders Shipped With Tracking And Delivery Confirmation Numbers. 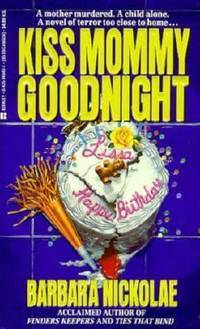 E Rutherford, New Jersey, U.S.A.: Berkley Pub Group, 1994 Very Good Paperback. . Mass Market Paperback. Very Good. New York, NY, U.S.A.: Berkley Publishing Group, 1994. Please email us if you would like further information or if you would like us to send you a picture of the book. Thanks for looking!. First Edition. Mass Market Paperback. Good. 16mo - over 5¾" - 6¾" tall. Berkley, 1994-11-01. Mass Market Paperback. Used:Good.